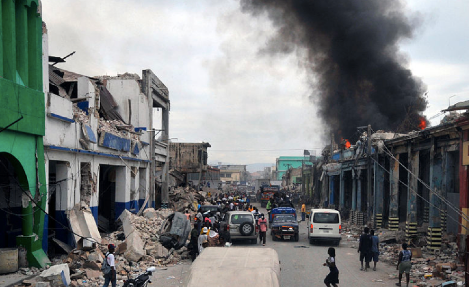 We established a system for mobile shortcode text messaging and communication post-disaster, utilized extensively in the 2010 Haiti Earthquake. This project centered on the development and deployment of disaster and post-conflict journalistic tools built on top of InSTEDD’s Riff collaboration and machine-based analytics software. Our prototype was tested in London, then field-tested in North Sulawesi, Indonesia, and deployed to Haiti for the January 2010 earthquake response. The EIS service was part of an ecosystem of organizations and tools, revolving around mobile services provided through the ‘4636’ shortcode. InSTEDD’s Nuntium message hub had direct connections to Comcel and Digicel, through which incoming aid requests were received in Hatian Creole, routed to Riff/EIS for analysis, shared with Crowdflower for translation, tagged and geocoded using local microwork organized by Samasource, then forwarded to Ushahidi and other tools for further visualization and dispatch. Then, using the EIS service, Thomson Reuters worked with NGOs and the Haitian government to send information messages to the population to help cope with subsequent threats and accelerate their recovery. We deployed technical support for Alertnet within 48 hours of the earthquake and worked on the airfield in Port Au Prince, helping with the setup and use of the technologies.